The Efferia group is a large one. Especially in the west where it may overwhelm you. In Arkansas there are really only eight or nine species with the old Efferia genus making up the majority. That genus has been split by Artigas into several new ones. This divides our local species up nicely. We currently have one Triorla (the separate genus), two Nerax, two Albibarbefferia and five or six Pogonioefferia species. There are likely more to discover. I have recently added my modified key to the Efferia of the eastern US here. It is in working order but if you have problems please let me know. If one goes out robber viewing you are likely to see Efferia everywhere. 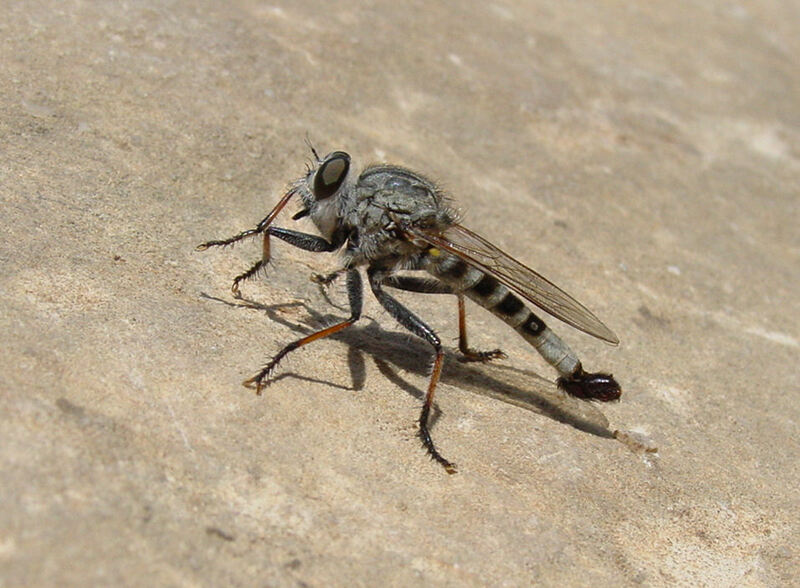 And Triorla interrupta may be one of the commonest robber flies in the state and in the east. The male Efferids often have large terminal genitalia giving them a bulb-tailed look. Females, in my short experience, always seem to outnumber the males, however. Females in several species have a prominent sword ovipositor extending out at the end of the abdomen. Length of this ovipositor can be important in separating the difficult females. This male was in Carlsbad Caverns area on the fine trails above the caverns. I still don't have a species.